Not only is failure an option, perfection is a pure illusion and, many times, a delusion of grandeur. Nothing important is ever accomplished if you do not allow yourself to experiment, and my definition of experimentation is ‘Failure many times followed by Success.’ Michael J. Fox, who is fighting to find a cure for Parkinson’s Disease and has been diagnosed with it, says: ‘Fail Faster!’ I love this! I interpret him this way: Waiting until you line up all of your goodies to get working on something hard will sometimes paralyze you. You Must first have a Clarity of Vision; Second Know your Commitments and Goals; Third Gather your Assets, tools, and Ideas; Finally jump in – yes, take a stab at those ideas and commitments because now that are tasks that require your implementation. Don't you dare wait for the rising moon on the east and the perfect breeze in the afternoon – you know what you need to do, and you must get to it!. Listen to Michael J. Fox and Fail Faster! I understand the point behind "failing faster." 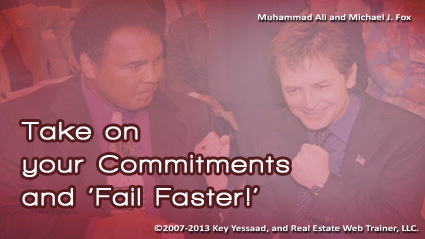 However, I've never been a fan of the "fail faster" philosophy. I offer a contrarian point of view in the post below. I'd love to hear your thoughts.